It is important that you carefully read the following general information and specific guidelines to ensure that your poster meets the required standards and effectively communicates your work. Scientific posters will be exhibited throughout the Conference week on poster display boards located in the main Poster Exhibition Area. The posters will be organized by Division 5 Research Group and Technical Session. You will receive this information at the conference check‐in. Timing for mounting & dismounting of posters will be provided here closer to the conference. We recommend that you print your poster before travel and bring it in a tube. Having your poster already printed makes for a more pleasant and relaxed start to the conference with no risk of missing plenary or technical sessions. However, just in case, we will provide a list of local businesses that can print posters at check‐in. The IUFRO Division 5 conference itself is unable to print posters for attendees. A poster is a presentation, not an object! There will be a special 2‐hour poster session; it is scheduled for Tuesday June 13, 17:30 to 19:30. During this session, at least one of the authors or a colleague who is registered for the conference must be available (physically near the poster) to make mini presentations of poster for conference attendees, and to answer questions. Posters that are put up by a colleague and left abandoned, with no one nearby to answer questions, are much less valuable to other attendees. Such posters are strongly discouraged and will be ineligible for Proceedings paper. 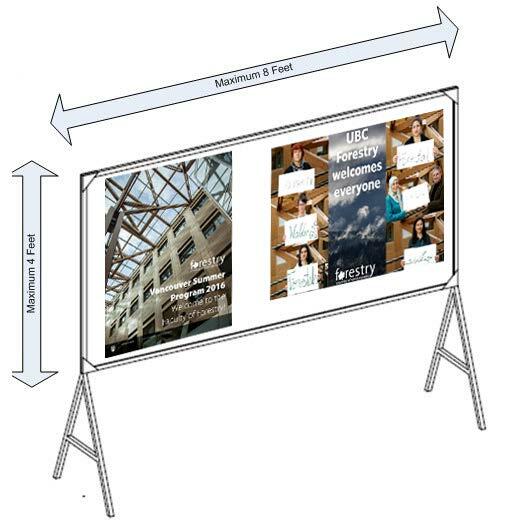 The dimensions of the poster display boards are 8 feet x 4 feet (244cm x 122cm). In general, 2 posters will be mounted per side of display board therefore the maximum space for your poster is 4 feet x 4 feet (122cm x 122cm). Your poster may be oriented vertically or horizontally but it must fit within the 4’ x 4’ maximum space. There will be up to 4 posters per display board (2 per side). A poster should be complete and self‐supporting so that different viewers may read at their leisure. The author should only need to supplement or discuss particular points raised during inquiry. Remember that several people of varying degrees of interest and experience may be viewing your poster at once. Therefore, you will want to make your points as complete and brief as possible. Full names and affiliations of all authors, including e‐mail address of at least one author. Introduction: a few brief sentences that state the purpose of the study. References: if you feel references are essential, include no more than 2 or 3. Posters should be designed accordingly with clear diagrams and text that can be read from a distance of 1.5 m. Posters are easiest to read using high contract colors (for example, black lettering on a white background). It’s easier to read a poster if the information is arranged in vertical columns rather than horizontal strips. Consider having a banner for the top of the poster indicating the abstract title, authors, and affiliations. Lettering should be about 1.25″ high for the title, 0.75″ high for the author’s names, and 0.5″ high for affiliations. Also consider placing the introduction at the upper left of poster and the conclusion at the lower right – both in large font. It is not necessary to post a copy of the abstract. Keep the text to a minimum ‐ most posters contain far too much text. Use a large font size, and bullet your major points. Text should be printed in fonts of about 3/8″ height (font size no less than 28). Do not use more than 2 types of font. Serif fonts such as Times are suited for most text. Sans‐serif fonts such as Arial are good for titles and headings. Figures should be easily seen from a distance. Use clear graphics and large font to accomplish this. The main points should be straightforward without extended viewing, but details should be included for those who might wish to discuss it. Because the amount of text is restricted, the figure legend could contain some of the commentary that would usually be contained in the body of a manuscript. Ideally, illustrations (photos, figures, tables & graphs) should dominate your poster. These should be at least 13 x 18 cm (5 x 7 inches) for easy reading. Use high quality illustrations of sufficient resolution. Captions and labels on visuals should be readable from two meters away. Graphs and figures should be simple ‐ avoid unnecessary detail. Lines in graphs should be heavy. Choose colors that are easily distinguishable from one another. Symbols, letters and numbers should be large enough to be seen from a distance of six feet. Graphs are preferred over tables. A number of PowerPoint poster templates for posters are available. You may wish to use one that can be downloaded for free. Remember to use a poster template size that fits within your maximum allotted space of 4’x4’ or (122cm x 122cm). There are numerous websites offering tips for creating a great poster.